How do you affect social change, be part of a "movement" and incorporate social justice and community into your life and work? 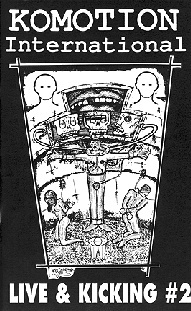 Those were questions I was exploring when I wandered into my first Looters show in 1987 at Caesar's Latin Palace. It was a benefit for something and at the time I needed to dance. I was out with my gay friend Quique who was trying to help me get over a break up. We liked the righteous attitude of The Looters and their infectious dance rhythms. A few weeks later I met Mat Callahan in a cafe on 16th Street with our mutual friend Debbie who managed bands and worked for Alternative Tentacles. She was helping me get my documentary shown that I'd made about a delegation of women health workers in Nicaragua. I'd only lived in San Francisco a couple of years and I'd never been to Komotion, but having seen The Looters play I knew I could relate to their activist/artist with attitude scene. I had recently returned from a long trip in the war zones of Central America and even though I had good friends and was very involved in anti-intervention politics, I wanted to expand my SF community, especially with other artists. The cooperative way Komotion seemed to work intrigued me. At the time I never dreamed how strong of a community it would become, or how long it would last. I came to Komotion the way so many others have, through a friend, through The Looters, through a myriad of crossing paths. It was a time when Reagan was president and the wars were still raging in Central America. Real people were being tortured and killed by US sponsored armies, and while we might not have had a huge mass movement for social change, there were demonstrations all the time and a hell of a lot of action was going on. My video explored the experiences of war trauma on the women in Nicaragua; one mother had found her daughter hung up in a tree with her breasts cut off, courtesy of the Contras. I had seen for myself the massacre sights and burnt villages and even been shot at twice by the Contras. Personally I was full of so much anger and contempt for our hypocritical society that I could barely deal with anything remotely institutionalized or structured, even in activist or art groups. But I felt comfortable at Komotion, I could be myself and there was a good turn out for my video. Some of the people I met that night (Margot, Robin, Annika, Mat, Claude) turned out to be some of my closest lifelong friends and creative collaborators. Margot and I joke now about how we sort of picked each other up as friends at my video showing. She was fairly new to San Francisco too and when she came up to talk to me about the video afterwards we hit it off. There was some kind of immediate bonding and we both got more involved with Komotion. Over the next several years I developed close relations with these people and many others working on the magazine and at shows. I had a wonderful creative experience working with the Looters Co-Directing their Music Video for Island Records, then our independent documentary. But it wasn't just that we had a lot of fun and wild times together, I think we created an experience that was exceptional and enduring because we also tried to consciously reflect on the values we were embodying as a group, in our structure, in our writing, and in our own art each of us was attempting to create. There was no set ideology you had to adhere to and we weren't trying to create one. But we did push each other to explore the edges of issues like what commodification means to art and how hierarchy, sexism, racism, solidarity and "multiculturalism" work in communities. This wasn't always smooth or easy and some of the best work got done through heated argument and debate. Conflict wasn't avoided and no one was trying to make everyone else come to some predetermined conclusion. It was an open process of exploring ideas where we influenced each other by sharing the books we read, the places we had been, and through the musicians, writers, performers, film/ videomakers, and activists we brought to Komotion shows. Over time we created a caring nurturing community that inspired conscious art. This community grew also from a context of international influences including Central American and so called "Third World" movements and music as well as other parts of the world. European activists came frequently to San Francisco, often on their way to Central America. They tended to have experience in highly organized cultural and political movements and many recognized the unique role that Komotion played here in San Francisco. In return I remember when a packed Komotion audience turned out to see a variety of video clips about European movements in Berlin and Amsterdam. I shot some of it with my video partner Tim (Modok) and collected other footage there. People were eager to see squatters battling cops to create their own communities (and winning), as well as huge demonstrations taking on the development practices of The IMF and The World Bank. Over the last ten years Komotion has supported the development of many successful musicians, performers and political groups who have in turn enriched us and our community. Like a spiral, a double helix, a continuous swirl, people spin in and out, contributing energy and time then alternately focusing on other life work. I know that the people from the Bay Area and around the world who feel connected to Komotion will continue to evolve its structure and form; time taking us all along like the next wireless wave into the 21st Century. 2001 here we come.